This is amazing. 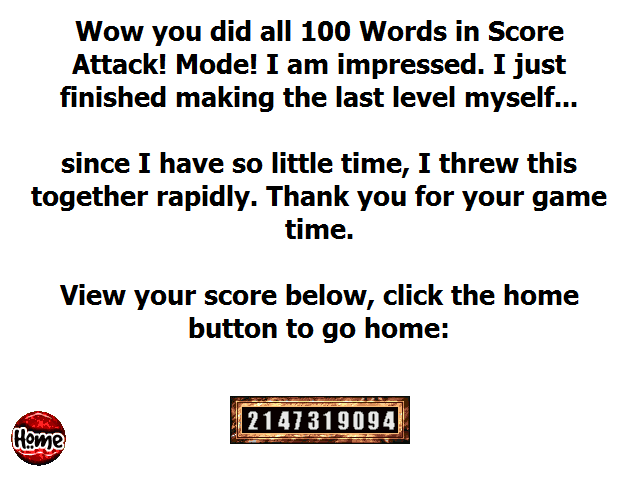 I was expecting recycled levels or randomized definitions or some other kind of phoning-it-in, but it's genuinely a thoughtful, gamified computer tutor that teaches you a hundred actual words through levels individually tailored to each word. I'm about 46 words in. I really like the "hydrozone" level, where you collect coins to gradually increase your jump height. I don't think I've ever actually seen that mechanic before. As a teacher sometimes, I love the potential of this format. It's maybe not feasible to build levels for every single vocab list, but for the Ten Words You Have To Memorize To Understand The Next Month's Worth Of Concepts, it could be a great mnemonic. I really really like your game. The hydrozone was my favourite platformer level to make, and I did the "increase your jump over time" thing a couple other times haha. 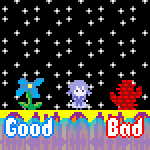 I found it really hard to quickly make good platformer levels, so I'm glad you liked that one! I don't think a teacher has ever played one of my games... funny that it would be my game that pretends to try to teach you things!! I know I will always remember that a yaffle is a picus veridus or whatever. I'm amazed by the quality put into into this game's presentation. It wouldn't look out of place on a actual flash/android game. Altough was it intentional that the Pronunciation/Hints were a lot quieter than the sound effects and music? Anyways, my favourite words were probably Designless and the Anti(dis(establishmentarianism)) trilogy. Also, the way the congratulations segment breaks down at the end is truly mind blowing. PS. can I quote any of this for my review summary blog post? I only tried this once with a day's break after playing normally, and it amazed me how much the definitions had actually stuck. PS. can I quote this for my review round-up?